Given that steak is such a dense heavy dish I never fully understood why steakhouse sides are always so heavy. Don’t get me wrong, I love me a good baked potato with butter, sour cream, cheddar, bacon and chives, but it’s not exactly what I’d call a contrast up against a big hunk of grilled meat. Melt the butter in a small saucepan over medium low heat. Add the flour and stir together to form a paste, continue to stir and cook for a minute or two. Take the pan off the heat and with a whisk in hand, add the milk and whisk until all the chunks of roux have dissolved. Put the pan back over medium heat and stir with a silicon spatula making sure to scrape up the bottom and sides of the pan to keep the bechamel from burning. Add the salt and continue to cook and stir until it's about the consistency of gravy. Take it off the heat then add the truffle oil stirring to combine. For the chard, seperate the white stems from the leafy part and boil the stems in salted water until almost tender. Add the leaves and blanch for about 1 minute. Drain and rinse with cold water until it's cool enough to handle. Grab a handful of chard and squeeze out enough water so the leaves aren't watery. 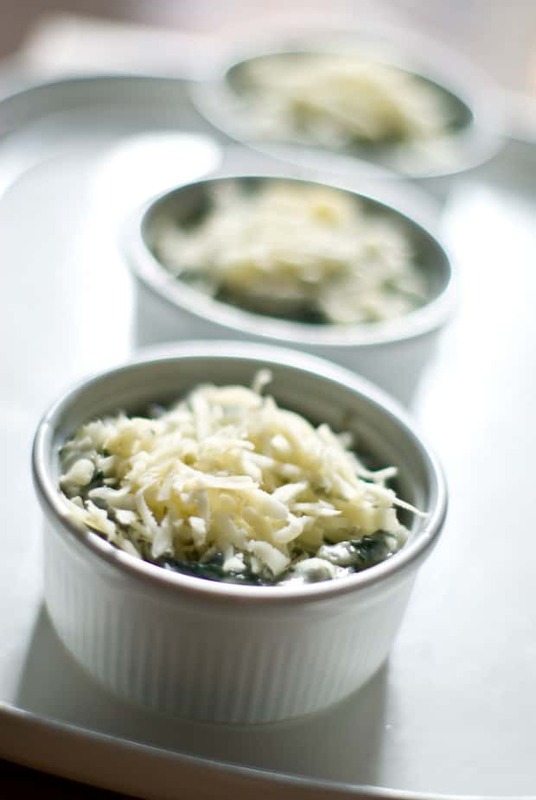 Chop the chard up and add it to a bowl with the bechamel and about 1/4 cup of grated Gruyere. Mix in some fresh ground black pepper and taste for salt (adding more if need be). Add in the shaved black truffle then divide between 4 ramekins. Top with the rest of the Gruyere and put it under a broiler until the sauce is bubbly and the cheese is melted and brown. Sprinkle a bit of fleur de sel on top and serve. Marc, you didn’t use cream but you made bechamel! I like that idea..not sure how much “healthier” it is but still delicious. A great side to a hearty steak dinner. I love steakhouse sides…the heavier th better…I’m so horrible like that! This looks wondy-ful! Looks and sounds gorgeous. What kind of truffle oil to you use? zomg I must try this! I make a gratin from my greens all the time, but this seems, I dunno, more orgasmic? Win. I agree with the sides offered. This looks incredible.I have just really discovered chard this year and I can say I much prefer it over spinach. Omg, I know what you mean. When ever I go to a steakhouse, I’m usually craving the sides. However, they’re always overly loaded with butter and or cheese that it just unbelievable! But I eat it anyways, sadly..
Oh why didn’t you post this back in May when I was getting chard every week in my CSA??? That looks really good. I have never had truffle and I have not been able to find it… It sounds like it would be good without the truffle as well. 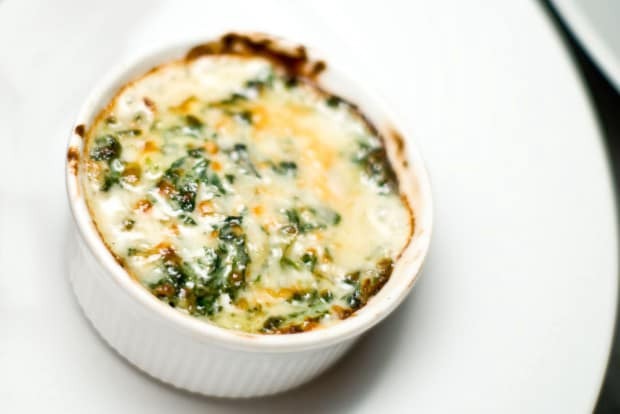 Swiss chard in bechamel is a childhood favorite and adding truffle oil makes it an instant adult favorite! whoa. i think i just gained weight looking at that picture. i’m drooling. marc, this is a WINNAH! I have numerous troubles with my web browser Charlie on your website. The gremlins are in the page :).